Way back in the winter of 2008, I attended my then-boss's Hanukkah party. He's fairly well-connected & has a lot of cool friends, both DC-famous & actual-famous (see: the Clintons), so it's always a topic of office conversation to wonder who will make an appearance at his annual soiree. That year, I was totally overwhelmed by the DC-ness of the whole event, & so I spent most of it talking to coworkers. I don't consume latkes very often (uh, once a year), but I can definitively say that these latkes were the best that I had ever eaten ever. I think I ate seven. Seven latkes. That's, like, three whole potatoes. Starch par-tay! I've basically been talking about these latkes ever since. I repeat: I've been talking about latkes since 2008. And I haven't been to that Hanukkah party since, so I haven't eaten those latkes except for that one time - but every holiday, I remember their glory & how other potato pancakes fail to stack up. You know where this is going. This year, newly returned to the District, I was invited again. Circa 8pm on Wednesday, I decided I wasn't going to attend. Too much work to do! But at the last minute, I reassessed: "You've been talking about these latkes for half a decade." So I hopped a cab & headed deep into the abyss of Cleveland Park, hoping to catch the tail-end of the event. It took so long to get there that by the time I arrived, everyone was on their way out, the party clearly winding down. My coworkers were still there, though, & so was a special guest: Supreme Court Justice Elana Kagan. As I stuffed my face with three of the World's Best Latkes™ , Justice Kagan introduced herself to a group of five recent college grads working in a fellowship position at my old office (the same one that brought me to DC back in 2007). As she made her way through them & turned to those of us standing nearby, I quickly wiped the grease off my grubby, latke-loving fingers so I could shake her hand. She was kind & funny & also a fan of the latkes. Hi! I'm Kate, & I used to work with David. I mean, I sort of still do. I was just wondering, do you make these latkes yourself? You do? Oh, man, well, I just wanted to let you know that I haven't been to your Christma- I mean, Hanukkah party since 2008, but I really loved them & have seriously been talking about them ever since because they are that good. Like, they're the best latkes I've ever had, & I thought for sure they were catered, so well done. You should imagine me sounding very enthusiastic & rambly while saying this, & also being a little sweaty & out of breath, because I'd arrived, like, four minutes prior & was actually in a rush to eat every latke in sight. It was one of those things that could've gone OK if she'd just, like, laughed at me a little bit & seemed amused. Instead, she seemed horrified. Later, she whispered to her husband, "Yes, Kate really likes our latkes." Yes, I spent $24 on a cab ride just so I could spend 20 minutes at a party where I ate nine latkes & made a total weirdo fool of myself to my boss's wife. And... yeah, nine latkes. I don't even want to know how many potatoes that is. I know that it added up to, like, a bazillion Weight Watchers points & that I can basically never eat food again - and still, I opted to have more of them for lunch the next day. At work on Thursday, a coworker walked in on me loading a plate with a few of the leftovers. "Oh!" he exclaimed. 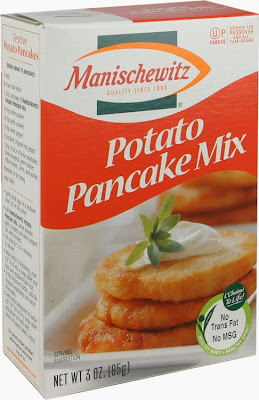 "Latkes made from a boxed mix! Your favorite!"